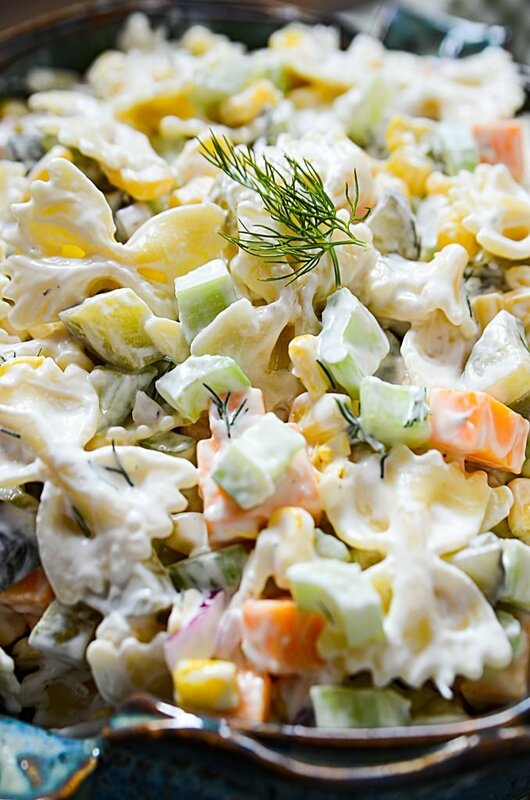 tangy and creamy dill pickle veggie pasta salad!! Super Yummy! Whaaaat??? DILL PICKLE VEGGIE PASTA SALAD??? Hold onto your stuff friends, because yes, I said Dill Pickle Veggie Pasta Salad. While it’s a mouthful of words, it’s also a mouthful of flavor! Veggies with a tangy dilly flavor, a nice crunch from the pickles and corn, creamy creaminess from the dressing, and a yummy richness from the cheese. Yes my friends, this salad has it all! -Dill pickles and cheese, we KNOW that combo goes well together, right? (think a burger, lots of people love their burgers with cheese and pickles, myself included!). – Creamy and crunchy – the dressing is creamy, and yet the other ingredients give it a nice crunch, so you can’t deny those facets aren’t best friends! 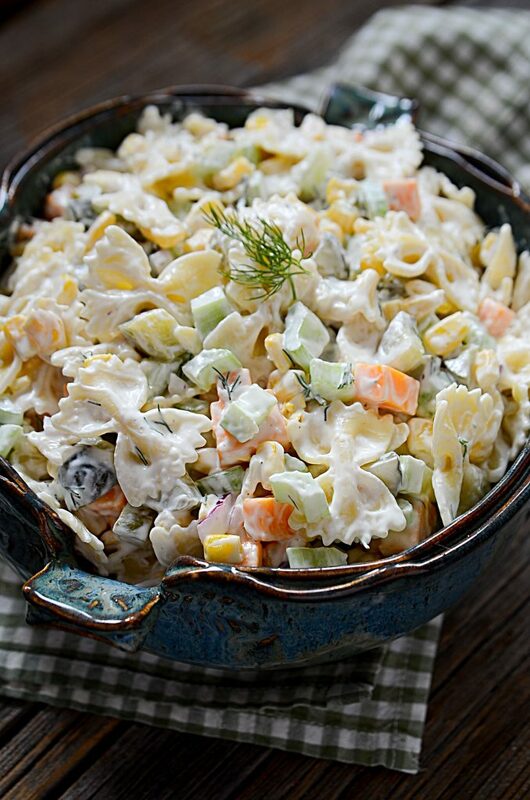 – Pasta – ok, so the shape doesn’t matter much for this salad, but who doesn’t like a great creamy pasta salad at a cookout?? – Tangy flavors – again, the marriage here of tangy pickle juice in the creamy dressing, along with the tangy crunch of the pickles in the salad – it’s seriously something that’s undeniably good!!! Honestly this salad is so easy and SO tasty to put together, you won’t be sorry you gave it a go. It’s basically cooking the pasta and cooling it down. Making the dressing and putting the veggies together with the pickles. Simple dimple!! – Make the salad the morning of when you want to serve it. It gives the flavors a lot of time to mingle and be besties. – Leave the cheese cubes out until you’re just ready to serve. It’s nice to have them cheesy firm instead of slightly soft in the salad, but honestly, it’s your call. Adding it all together will totally work as well. – Use ANY pasta you prefer. I liked using bowties because they’re cute as a button in this salad and their size is good for adding bulk, but something like orzo wouldn’t work well I think, because it doesn’t really have the bulking capability. 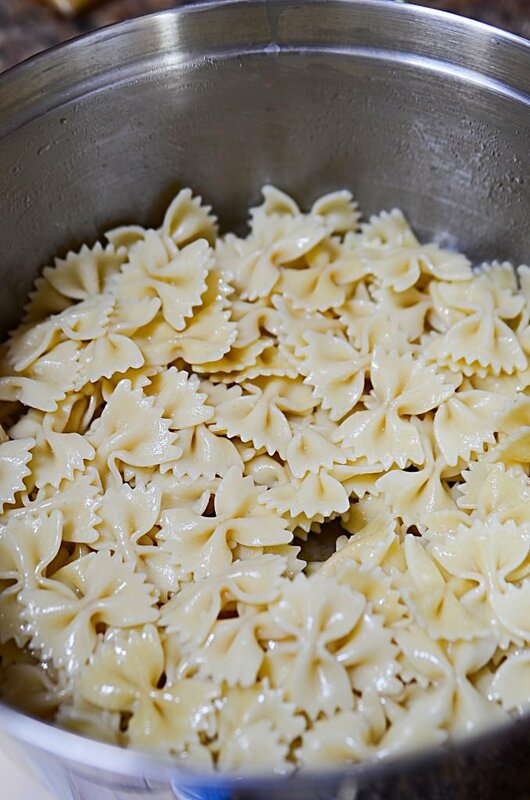 Anything like macaroni, rotelle (wheels), penne, rotini, etc., would work just fine. – Don’t overcook the pasta!! There’ll be a lot of tossing and folding in this prep, so if the pasta is too soft, it’s going to break up and not look pretty. And we all like pretty food! I made this salad and served it at a mother’s day brunch. I got A LOT of compliments on the salad!! I think the fact that it’s a bit different than your typical, basic pasta salad, that makes it a crowd pleaser. If you’re not quite sure about making a pasta salad with dill pickles in it, here is a compilation of pasta salads you can check out, and oh, and a salad with feta and beats and avocado that was CRAZY GOOD in case you want to make TWO salads!! – Click here for THAT amazing recipe! The first link I gave you for the other pasta salads are if you wanted something different other than pickles in your pasta salad…. 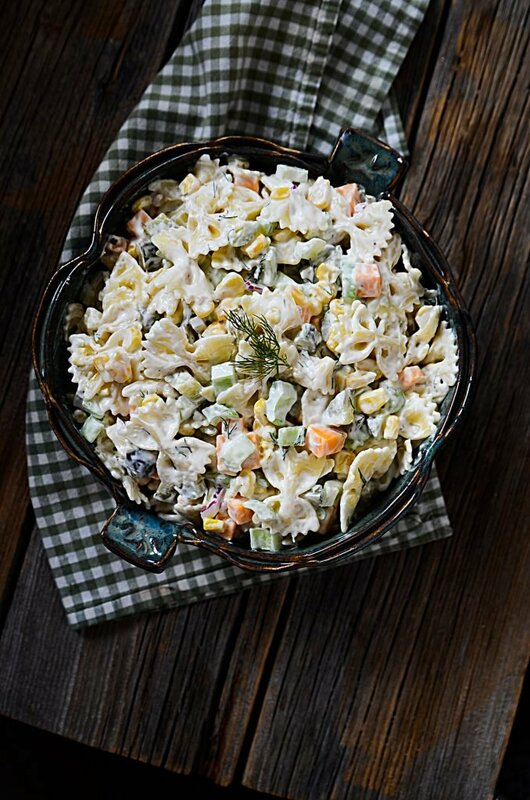 BUT… I definitely recommend making this adorable dill pickle veggie pasta salad if you want people to think you’re the superstar of pasta salads. And honestly,…… why shouldn’t they?? You ARE a culinary superstar my friend! 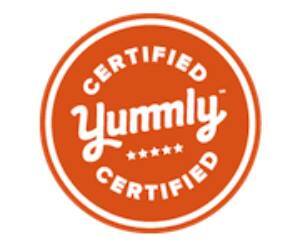 Yummy, tangy, creamy, and crunchy! This salad has it all! Bring this to any event and you'll get compliments!! Also if your kids like pickles, they will LOVE this recipe!! 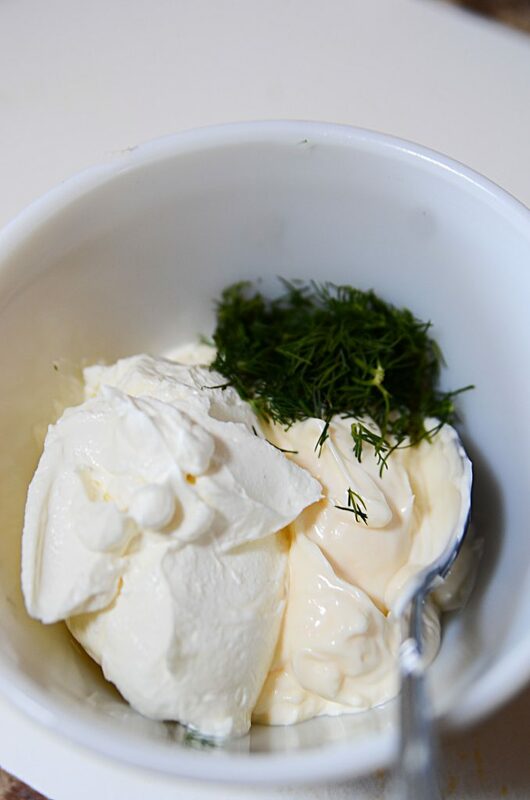 1 tbsp or more of dill weed, chopped (fresh). If using dry, only use 1/2 tbsp. In a bowl, combine the dressing ingredients and set aside. 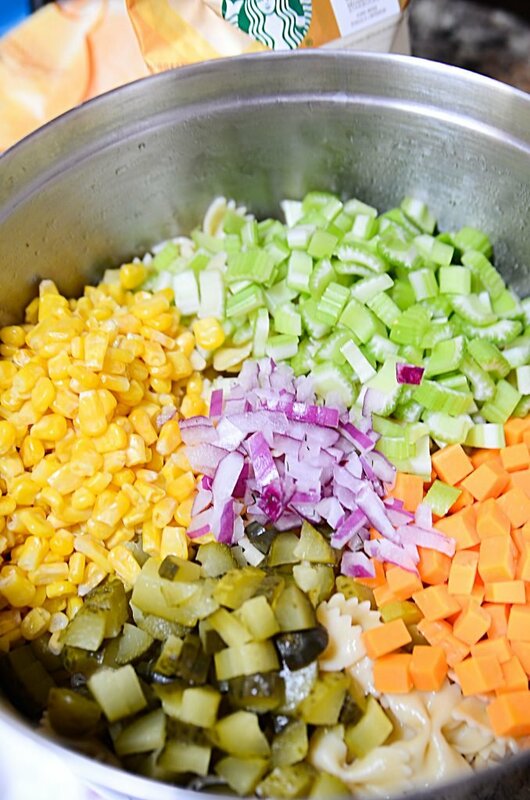 In another bowl, combine the cooled pasta, red onion, corn, pickles, and celery. Toss well. Add the dressing and fold to combine well. Refrigerate the salad minimum 1 hour.